HealthQuest and the Medical Appeals Panel involvement in false medical reporting. NSW Workcover Authority fails to prosecute workplace bullies. 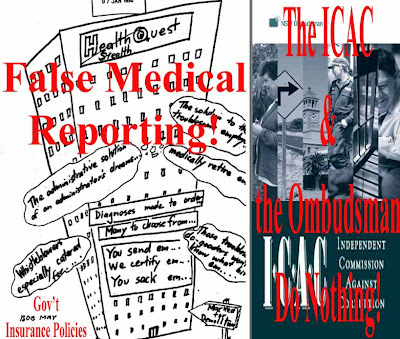 The ICAC and the Ombudsman do nothing. Who is going to adjudicate between the Government and the people?We should be alarmed. Governments promoting people into high places who have acted corruptly but not prosecuted because these people cannot take responsibility for the Governments Directives. The Government then promotes those who will cross-over the line by stealth. Within the NSW Prison System I had the opportunity to be entitled to a visit by the Official Visitor. (A good cop). Thinking this person can help me in some way. I was wrong. Our given agencies and democratic institutions like Tribunals, Commissions, Ombudsman, ICAC, HREOC, government arms etc, have all been bought out and are merely giving government our strategies to use against our helpless situations. These people my friends, are the good cops. I thought some time ago these agencies were an insurance policy for protecting politicians. Staling until those people were out of office. Then after you have proved your case with prime evidence, say could be three years or more. Suddenly it is explained there is no utility or funding and the person does not work there any more. They are protecting the bad cops. We are not being served as Michael Costa describes. We my friends are being forced. And some of us deliberately provoked. We fund them with our taxes and they do not serve as the public expects. Nor do they showcase our claims of maladministration by government departments, if in fact it does not serve the governments political agenda or hip pocket nerve. ED: Why not talk to a brick-wall? At least the wall won't hurt you. You will get no answer I can assure you. But the wall won't strike you or attack your integrity.